If you’ve ever had your bus show up later than scheduled, here’s a welcome development for you. Volkswagen, with the help of D-Wave, has tapped the power of quantum computing to develop a traffic management system that can better process transport information and improve the performance of fleet services like taxis and public buses. According to the German automaker, the quantum system can replace current traffic models that are created by conventional supercomputers. Those systems are hindered by the fact they can only process so many tasks at a time and traffic has a lot of (literally) moving parts that have to be taken into account, including movement data collected from smartphones and transmitters in vehicles. 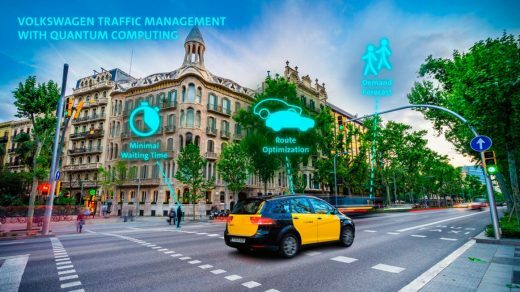 Volkswagen’s system uses a quantum algorithm to process and optimize all of that data and spit out more timely and accurate traffic information. The result, the company claims, will be better-run roads. Public transportation options would be able to better serve riders and spend less time driving around with empty seats. Taxis could cut down on wait times and get to passengers quicker. And as autonomous cars are deployed on city streets, the algorithm could help relay important information to those vehicles to put them on the quickest path and keep congestion to a minimum. For now, Volkswagen’s quantum computing solution is more concept than reality. The company presented the project at the WebSummit in Lisbon and is positioning it as a commercial venture that could be sold to cities. Volkswagen said it wants to test the algorithm in Barcelona — where there is already an adequate database of traffic information available — before rolling it out elsewhere, but it can theoretically be scaled to a city of any size.